Access every script in Hypnotic World's scripts collection covering more than 1,200 issues. New hypnosis scripts are added weekly and members can use our Request-a-Script service for expert help in client cases. Browse fascinating discussions in Hypnotic World's lively hypnosis forums. Post your own queries and comments, and share your experiences with other hypnotherapists. Join in discussions on individual issues and scripts, and track replies to your posts in the members' area. Additionally, members receive specialist advice on client issues from a qualified, experienced hypnotherapist via email. Plus: Use the Hypnotic World Member's Voucher for a 10% discount on over 350 additional hypnosis MP3s. 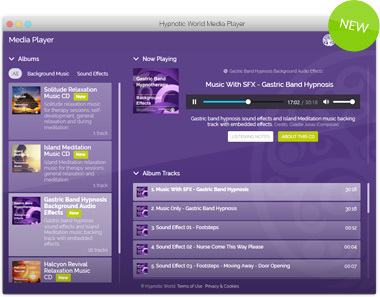 Access a library of relaxing music composed especially for hypnotherapists using the Hypnotic World Media Player. Includes calming background music tracks and a range of sound effects to enhance your therapy sessions with clients. 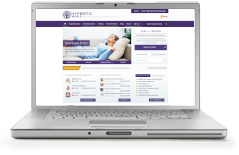 Promote yourself to visitors in your area with a full listing in Hypnotic World's Find-a-Therapist directory, visitors' one-stop guide to local hypnotherapists. Update your listing at any time - add areas of treatment, qualifications, contact details and more. Enable potential clients to reach you with a free online contact form, and let existing clients leave feedback to boost your therapist rankings. "I find the selection of scripts provided excellent. I am enjoying going through them. I have used several so far on my clients and they work a treat." "I have three clients today and I'll be checking for scripts when I plan the sessions...!" "As well as offering a constantly updated supply of scripts, I particularly appreciate the speedy, helpful and courteous response of the Hypnotic World team to any confusion or query I may have." No per-script fees. Cancel any time. Q. Do I have to purchase each script with a membership? A. No. All Hypnotic World membership plans provide access to all of the 1,200+ hypnosis scripts in our collection, in addition to the above membership benefits. A. Yes - you can cancel your membership any time via your Account Settings or by contacting our Support Team. A. For memberships, we accept payments by Visa®, Mastercard®, American Express® and PayPal. You can also purchase a membership by check here. Q. Can I read a sample script before I sign up? A. Absolutely. You can view a sample hypnosis script here. Q. Do you guarantee that I will be satisfied with my membership? A. Yes - more than three thousand people are enjoying the benefits of membership to Hypnotic World and you can cancel your membership at any time. We're here to help - email support@hypnoticworld.com or phone us on 1-800-497-7310 (US and Canada). We read and answer all emails within 24 hours.